Since 1970 the percentage of women incarcerated in U.S. prisons has risen from nearly 3 percent to almost 7 percent—more than doubling in less than 40 years. This article examines explanations for this phenomenon—concentrating on two: Changes in the relative rates of arrest for females and males and sentencing reforms that were instituted during this period. The authors examine trends in female to male imprisonment rates from 1970 to 2008 across all fifty states using panel analysis. The only robust relationship they find is between the ratio of female to male incarceration rates and the ratio of female to male arrest rates for drug crimes. Sentencing reforms designed to limit the discretion of judges and those designed to limit the discretion of parole boards (the elimination of parole boards or truth in sentencing) are not related to changes in the ratio of female to male incarceration rates. Published as "Gendered arrests or gendered sentencing: Explaining the narrowing of the gender gap in imprisonment over time: 1970–2008." Sociological Perspectives 54.4 (2011): 641-664. © 2011 by the Regents of the University of California/Pacific Sociological Association. Copying and permissions notice: Authorization to copy this content beyond fair use (as specified in Sections 107 and 108 of the U. S. Copyright Law) for internal or personal use, or the internal or personal use of specific clients, is granted by the Regents of the University of California/Pacific Sociological Association for libraries and other users, provided that they are registered with and pay the specified fee via Rightslink® on [JSTOR (http://www.jstor.org/r/ucal)] or directly with the Copyright Clearance Center, http://www.copyright.com. Harmon, Mark G., and Robert M. O'Brien. 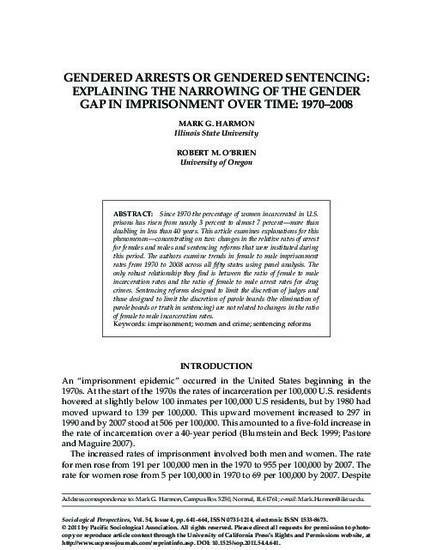 "Gendered arrests or gendered sentencing: Explaining the narrowing of the gender gap in imprisonment over time: 1970–2008." Sociological Perspectives 54.4 (2011): 641-664.